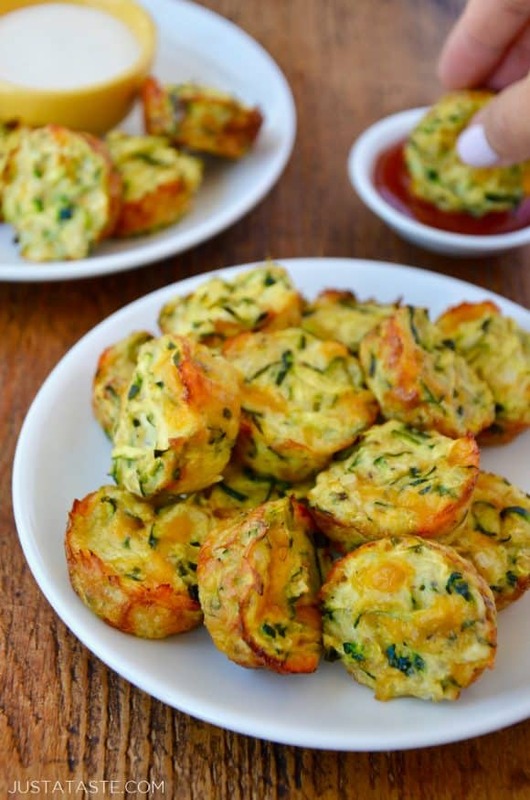 Skip the spuds and whip up a family favorite recipe for Cheesy Baked Zucchini Tots perfect for dipping and dunking. Many a veggie have appeared in tot form around these parts, from broccoli to butternut squash and cauliflower to now, zucchini! Sorry potatoes, but your starchy selves will have to sit this one out because Cheesy Baked Zucchini Tots are the latest and greatest way to eat our greens, sans the grease. With summer coming to a close, I’m looking for any excuse to turn the zucchini surplus into something extraordinary. We’ve covered zucchini chips, zucchini fritters, and even zucchini fries, but perhaps the most family-friendly (and lunchbox-friendly!) of the bunch is none other than cheesy tots. 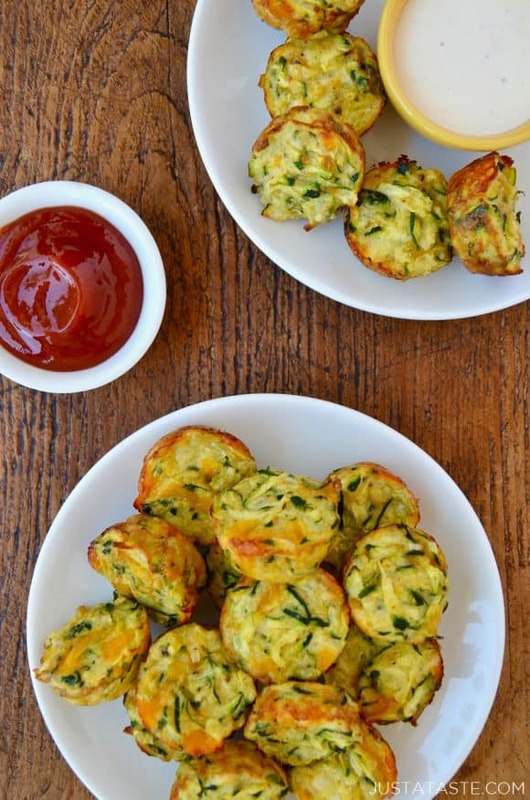 I’ve snuck not one, but two eggs into the mix, which ups the protein power of these zucchini tots while also leading to a light and fluffy texture akin to my all-time favorite Healthy Breakfast Egg Muffins. Any variety of shredded cheese will work well in these muffins, but I love the flavor pairing of zucchini and sharp cheddar. Rather than shape the tots by hand (and add unnecessary prep time to the equation), use a mini ice cream scoop to portion the mixture into a greased mini muffin pan. 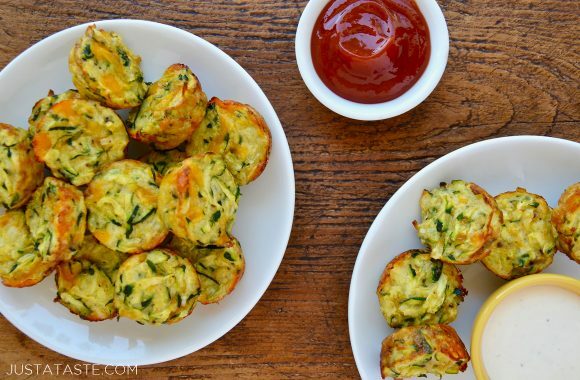 Pop them in the oven, and less than 20 minutes later, you’ll be dipping and dunking these cheesy zucchini tots into your condiment of choice. Keep it classic with ketchup or go big with quick-fix homemade buttermilk Ranch dressing. Preheat the oven to 400°F and grease a mini muffin pan with cooking spray. 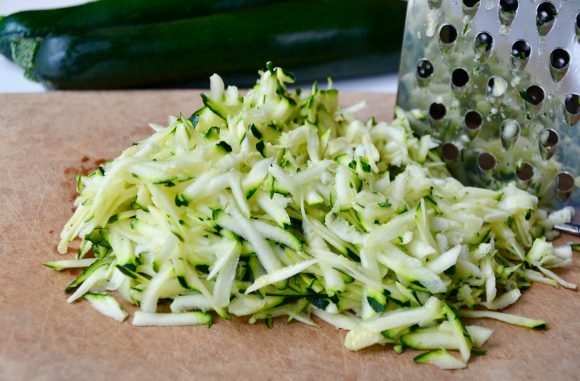 Shred the zucchini using the large hole on the side of a box grater then transfer it to a kitchen towel or strainer and squeeze out as much liquid as possible. 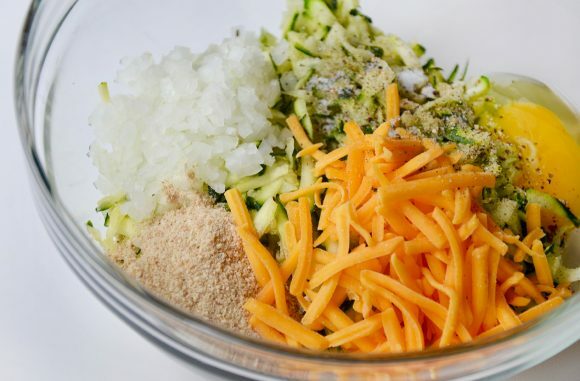 Transfer the strained zucchini to a medium bowl then add the diced onion, breadcrumbs, egg, cheddar cheese, 1/4 teaspoon salt and 1/4 teaspoon pepper and mix until combined. 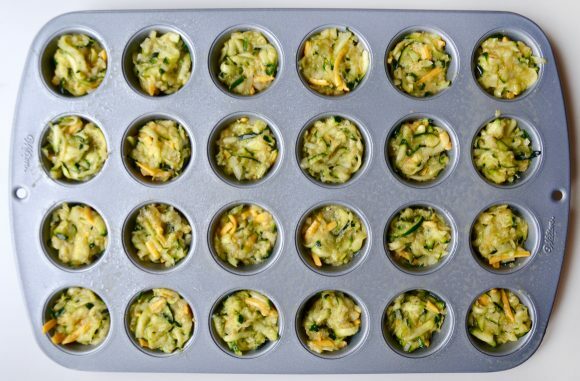 Divide the mixture evenly into the 24 muffin pan cups. Bake the tots for 15 to 18 minutes or until golden brown. Remove them from the oven and allow them to cool for 10 minutes in the pan before removing and serving with ketchup or Ranch for dipping.